Tanzanian opposition figure arrested for calling President Magufuli a "dictator"
Tanzanian opposition number two Tundu Lissu was arrested on Thursday, three days after having called President John Magufuli a “dictator”, party sources said. No reasons were given for the arrest of Lissu, a member of parliament, the Chadema opposition party chief whip and a leading lawyer. Government spokesman Hassan Abbas gave no specific reason for the arrest but said “the government will not accept that someone, or a group of people, abuse the freedom of expression”. Lissu was arrested at Dar es Salaam” airport as he attempted to take a plane to Rwanda, Chadema spokesman Tumaini Makene told AFP. On Monday Lissu told reporters that repeated arrests of senior party members, locally and nationally, were intended to muzzle any opposition to Magufuli, in power since late 2015. He called on “the dictator and his government, which is politically, diplomatically and economically isolated”. Magufuli, whose nickname “tingatinga” means “bulldozer” in Swahili, swept to power in 2015, presenting himself as a no-nonsense, corruption-busting, man-of-the-people. However critics see a wide authoritarian streak at the core of his populism. They argue he acts on impulse regardless of due process or political niceties, while being intolerant of any dissent. 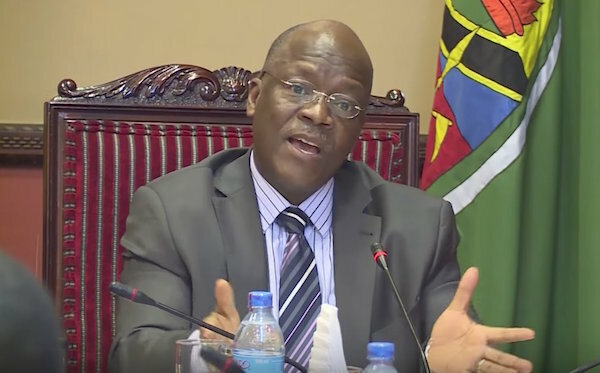 Lissu spoke of a “climate of fear which reigns everywhere”, accusing Magufuli of constructing “a system based on favouritism, tribalism and regionalism”. Opposition meetings are banned, newspapers have been shut down and journalists and artists have been threatened or received death threats for criticising the administration.